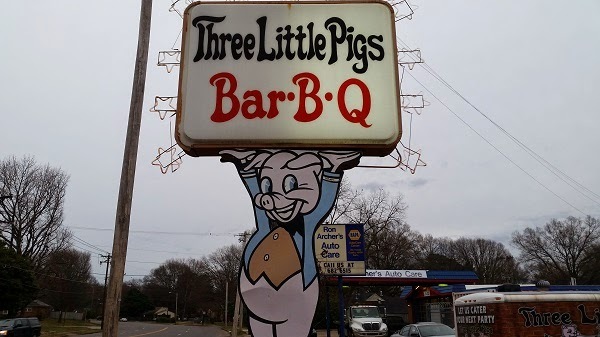 Three Little Pigs Bar-B-Q, Memphis TN – Marie, Let's Eat! 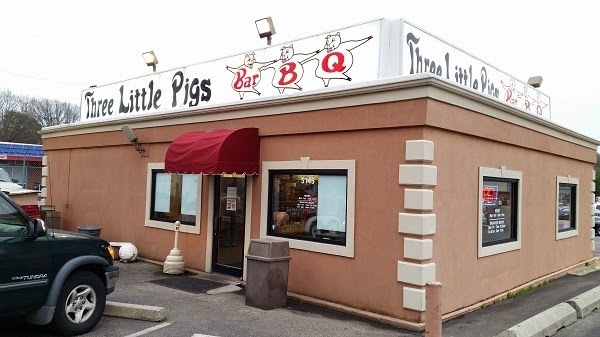 As the day wrapped up, and after we enjoyed a trip to the amazing Shangri-La Records, we picked up Marie and her sister from the con, dropped her at work, and drove on to our fourth barbecue destination, and then ran into a disappointment. I’d been looking forward to visiting Payne’s as our final stop on the Saturday expedition, but I did not do the proper research. They’re only open for lunch. We wouldn’t have one of their celebrated pig sandwiches on this visit after all. So we went back to the hotel for me to reconsider plans, and everything turned out all right. I even got to learn about a long-vanished chain of barbecue restaurants that I did not know about previously. It’s not like you can go to Memphis and have a hard time finding a place to get some barbecue, but when you’re not really familiar with the city, you’ve visited several of the celebrated places already, and the clock’s ticking because lots of them close after lunch on Saturday, you can’t devote too much time to finding a new place. So I quickly settled on Three Little Pigs, and the girlchild asked to stay at the hotel while the rest of us went out to eat. We brought her back a burger and tots from Sonic in the end, and boy, did she ever lose out. While very much in Leonard’s shadow, this place served up the best of the three new-to-me meals of the day. 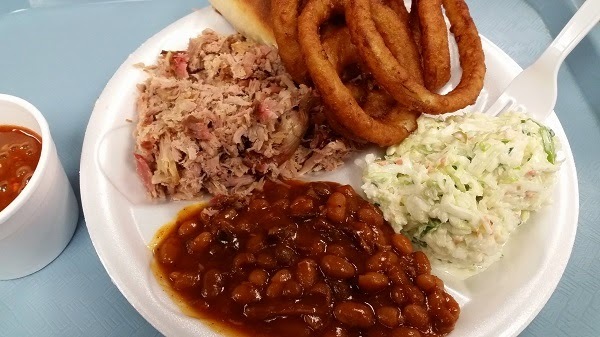 I ordered a chopped pork plate with beans, slaw and onion rings, a steal at only $6.54 even if the rings were absolutely ghastly and were thrown away. The meat is flavor-packed, chopped and weighed to order, smoky and moist. It’s pork shoulder, cooked over hickory in an indoor brick pit for almost 24 hours. I’m really impressed that they can cook it for that long and it not come out drier than it does. I had it with a delightfully hot sauce, thick and sweet but with a good bit of heat from a mix of pepper flakes in the brown sauce. It mixed extremely well with the meat. There’s a similar sauce with the beans, which are baked with pork and are, by leagues, some of the best baked beans I’ve had anywhere. I usually don’t order baked beans in Georgia since so few people do it really well, but many restaurants in Memphis take some justifiable pride in theirs’. Lastly, the slaw was another winner. It wasn’t quite up to Leonard’s level, but the thin mustard-vinegar mix was still really good. That said, they still do huge business – a long line formed behind us, proving that we had excellent timing, at least – and have been doing it since the mid-1980s. I asked how long they’d been around, because I loved the old sign out front. It turned out that this restaurant was once another, Loeb’s, and the sign was originally built in 1968. When you drive around Memphis, you’ll see signs for Loeb Realty everywhere. That’s the same family. We wrapped up the day by bringing the girlchild her dinner from the Sonic on Poplar, and we indulged in some dessert drinks to sip on as we got tired back at the hotel. Since Sonic has been slowly retreating from Atlanta, it’s nice to occasionally stop when we see one so that Marie can have a grape slush, one of her guilty pleasures. Posted on April 19, 2015 August 21, 2017 by Grant G.Posted in barbecue, memphis, tennesseeTagged barbecue, memphis, mustard slaw, tennessee.